The title of this post might give you a little hint regarding one of the crochet projects I've got in the works right now. I'm using this little bit of gloriousness from Scheepjes.. I mean, seriously. Can you just drool over those colors? The yarn on the left is Catona and the right is Cotton 8. Right now I've got the Catona on my hook in some vibrant primary colors. Wanna see? Let me tell you that the Catona yarn (100% mercerized cotton) is superb for the durable kind of project I'm working on. It has fabulous stitch definition, won't fade or fuzz (because it's been treated) and is surprisingly soft. You can see the two sizes of skeins available in the pic above--50g and 25g, so you can get just the right amount for your specific project. I am loving the 25g balls--just perfectly sized for projects with lots of colors! Who, me?? Colors?? And at about $1.25/skein--you can get all of the colors you want! 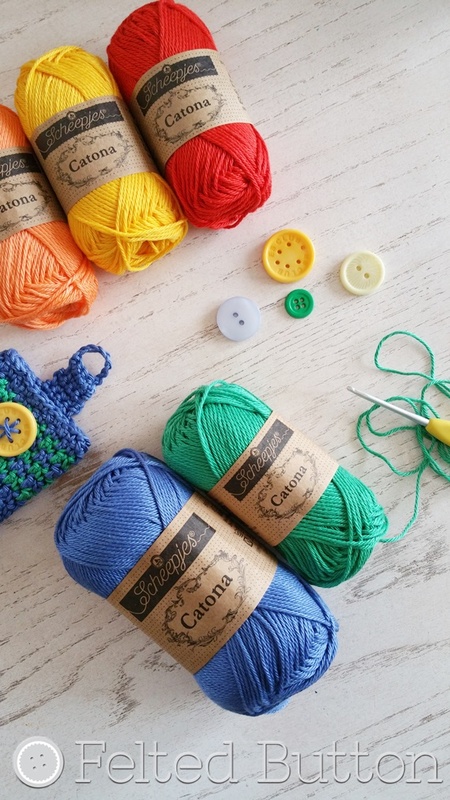 Get your hooks into the Catona (or any Scheepjes yarn) from Wool Warehouse. I've also been trying to get myself organized. And for some reason the phone calendaring thing was just not working--at least for Felted Button business planning. So, I figured--go for it! I found this planner from Erin Condren and am loving it so far. Now to get over the OCD thing of writing all over it--even if it's not cute. Hence, the pencil. I'll commit to a pen. Soon. Very soon. Notice the wee little string working off my hook. 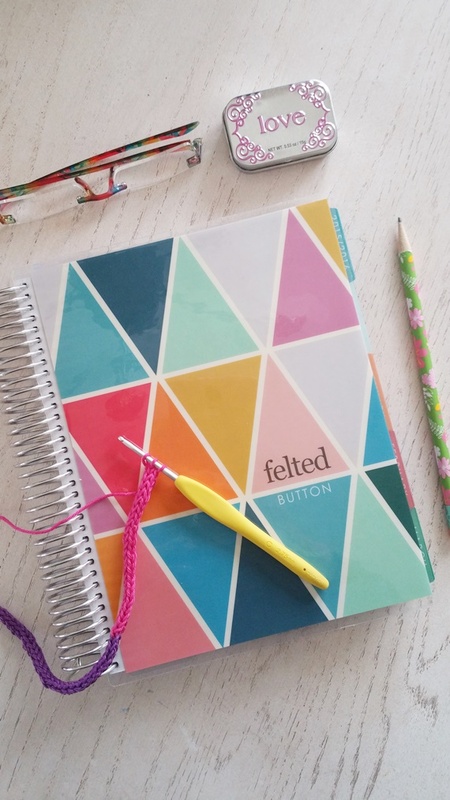 I've got plans to share that technique and free pattern with you, too. It's pretty nifty, if I do say so myself. So stay tuned! I'm off with my color-swirling brain to play with yarn. What a life I have!! Be well. Eat your veggies. Be nice to your brothers and sisters. Wear your seatbelt. Think kind thoughts about yourself and others. Be grateful. | On the Board | -- No one has failed who keeps trying and keeps praying. **Affiliate: This post contains links which provide me with a small percentage of a sale should you purchase through them but doesn't cost you any more. Thanks! Gorgeous! How does Catona compare to Cotton 8 in softness? Also are they compatible in terms of weight?